Whiplash injury is commonly seen in motor vehicle accidents. Rear-end collision can result in this acceleration/deceleration injury of the neck. The patient may suffer from a broad range of symptoms immediately after the accident or after several symptom-free days. Hyperextension of the neck may or may not happen. 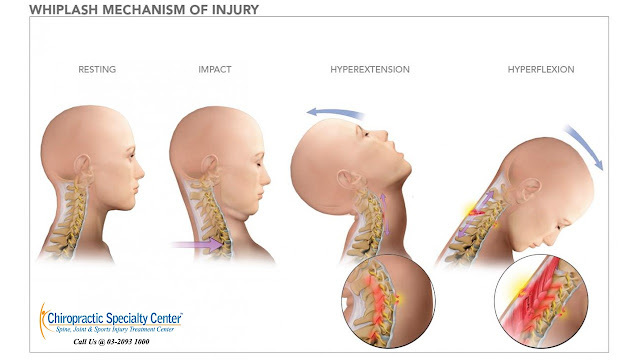 However, inter-segmental hyperextension of the cervical spine may be the most likely cause of whiplash injury. The instantaneous axis of rotation is being changed and more compressive forces are being placed on the facet joints and disc of the lower cervical segments. The most common signs and symptoms of whiplash injury include neck pain with muscle spasm, limited range of motion of the neck, loss or reversal of cervical lordosis curvature, headache, numbness or weakness in the upper limbs, vertigo and tinnitus. Rear-end collision usually involves a sequence of events resulting in whiplash injury. They are divided into phases. Phase 1 – When a motor vehicle is hit from the rear, the passenger’s body is forced back into the seat. The body moves upward simultaneously and result in straightening of the curvature of the neck. Then the head and neck begin to move backward. Phase 2 – The vehicle reached its peak acceleration when the head and neck are extending backward. Additional acceleration to the body as a result of extra energy stored in the seat from the backward movement of the torso. Acceleration may be prolonged if the driver has released the brake. Phase 3 – Deceleration occurs and the head and body are thrown forward. This will be accentuated if the driver’s foot is reapplied to the brakes. Phase 4 – The seat belt and shoulder harness will restrain the body and the head will decelerate forward.